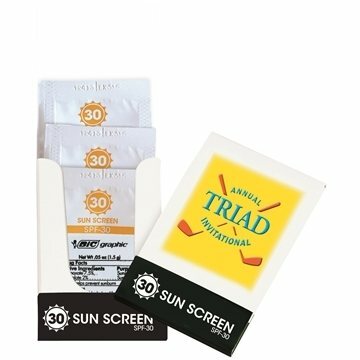 The perfect giveaway for any outdoor event, our SPF-30 Sunscreen Lotion Pocket Pack offers maximum protection for minimum cost, and allows up to a 4-Color Process imprint to maximize the effect of your message! Specify tuck-in flap color; if not specified, we will use our best judgment. Materials: Packet: Paper, Contents: Varied. Not what I expected but still like. Looks like a box of matches from packaging. When you open it up there are three small packets of sunscreen inside. Still like the product and would order again, just not what I was expecting from the description. Item as ordered. AnyPromo provided easy communication for purchase proofs. Items shipped and arrived quickly. Product pretty good as well as customer service! the price and shipping charges were the best.